If you’ve never used a dog harness before for your furry friend, then it’s past time to start using one, especially if your dog tends to pull a lot on a leash. A leash or collar can often be harmful for dogs that pull, not in any damaging long-term way, but it’s simply painful in their journey to break free from the leash, as you try to pull back and not lot them go. A dog harness is just so much easier to use when you’re taking your dog for a walk or to the park. The leash attachment ring on the harness strap that goes across the front of the dog’s chest is just such an invaluable tool. 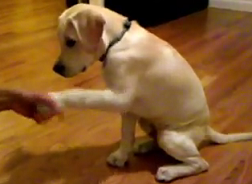 You won’t harm you puppy in trying to teach him or her not to pull, but you’ll also be able to get a better handle on their movements, too. Not sure what harness to pick up for your pet? Follow along below, and we’ll show you the best options available today. Here are our top picks. The Rabbitgoo No-Pull Dog Harness is one of our favorites, due in part because of the sheer versatility that it has. It can be adapted to use with small, medium and large dogs. It’s made out of a 3M reflective material, which means that traffic will be able to easily see your dog at night, and hopefully slow down or avoid your furry friend because of it. This harness evenly distributes pulling pressure across the chest, which prevents harm from pulling back or even choking the dog. The material itself is breathable and comfortable, so your dog might actually end up enjoying wearing the vest. 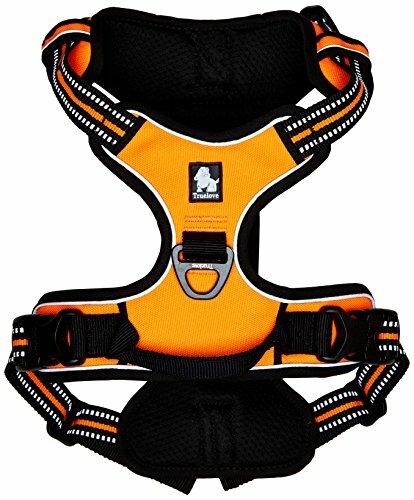 This harness comes in Black, Green, and Orange. 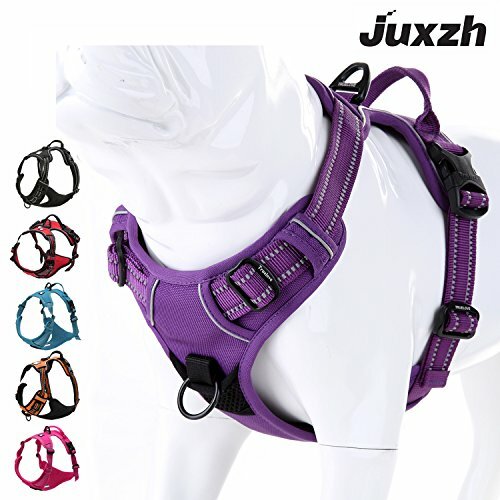 The JUXZH Soft Front Dog Harness comes in as #2 on our list, and is another excellent one to purchase. It is versatile, so you can adjust for different sizes and shapes of dogs; however, you do need to determine the size of your dog before purchasing, as this one comes in Xtra Large, Large, Medium, Small, and Xtra Small options. It’s available in a variety of colors, too. It has a comfortable and ergonomic design, which ensures not only maximum comfort, but ease when putting it on your dog, too. This is another one that evenly distributes pull, which prevents you from choking your dog when pulling back on her. This one has extremely good visibility at night, keeping your dog safe even when it’s pitch black out. 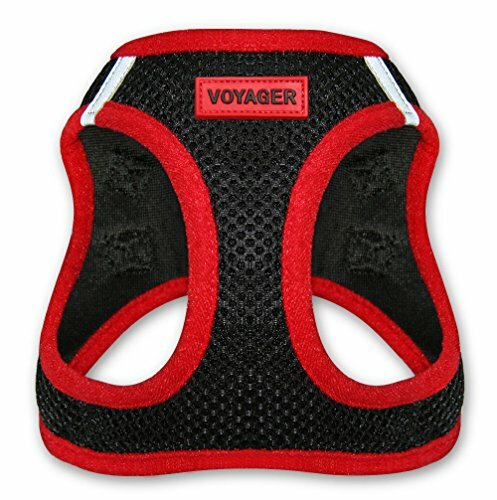 Next up is the Voyager All Weather No Pull Step In Dog Harness. This is a favorite, simply because of how easy it is to put on your dog. This has a one step-in design, which makes it extremely easy to put on your dog. 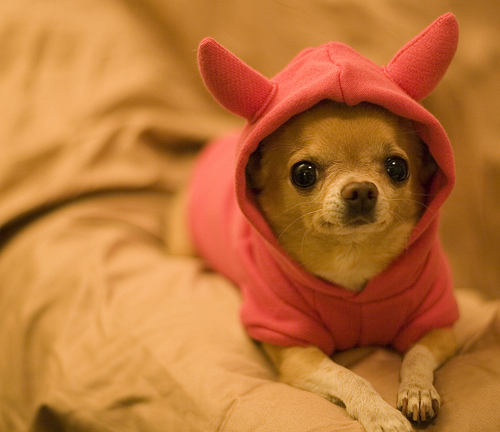 It’s made out of a comfortable and breathable material as well, so you’re pet won’t be constricted when wearing it. It has a strong velvro closure and heavy duty metal rings for leash attachment. 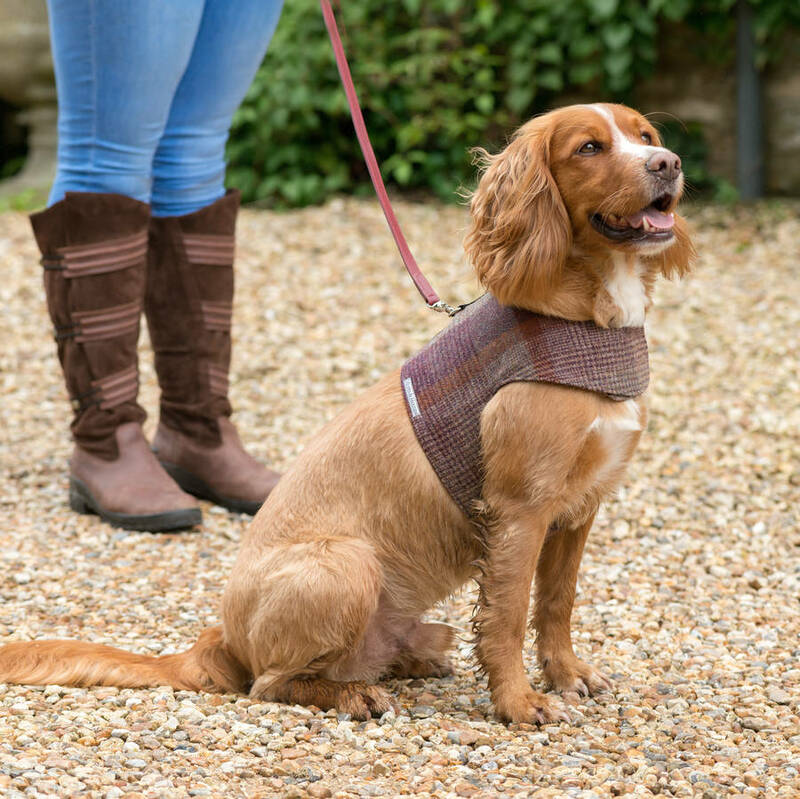 Resistance is evenly distributed across the chest to keep your dog safe and free from harm when pulling. Make sure to actually measure your dog’s size and refer to Voyager’s sizing chart before buying, as you want to make sure you’re getting the right on the first time! Next up is the Chai’s Choice Outdoor Dog Harness. 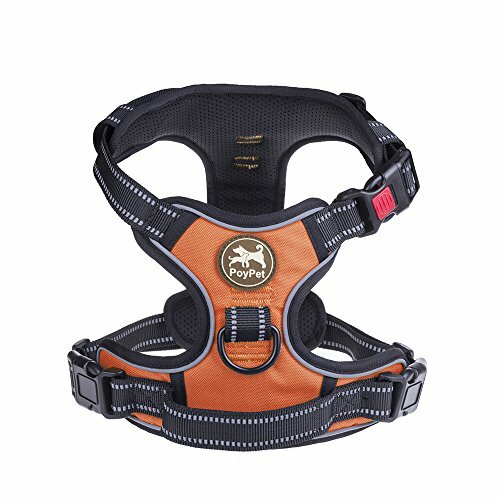 If you’re someone that likes to go on outdoor adventures with your pet, then this Outdoor Dog Harness is for you. It’s made out of a comfortable, yet sturdy material. 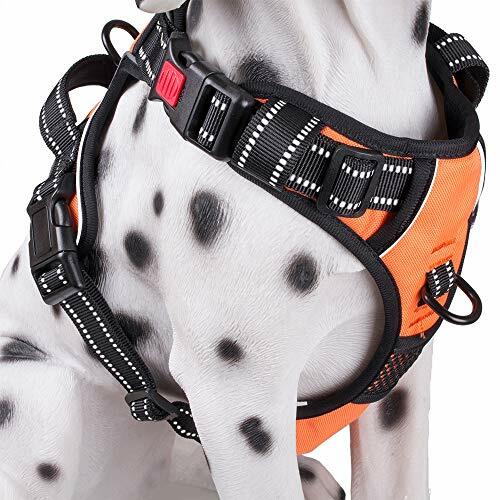 There’s reflective material built-in to keep your dog safe in low visibility hours, and there are multiple alloy-rings on the harness for different types of leash attachment. It has an ergonomic, comfortable design for your pet, so she won’t mind wearing it for hours one end. Last up on our list is the PoyPet No Pull Dog Harness. This one is super easy to put your pet in, as it secures your pet through quick buckles. There’s two on your dog’s chest area, and one over her neckline. There’s reflective material built-in to ensure she’s safe during low visibility hours. 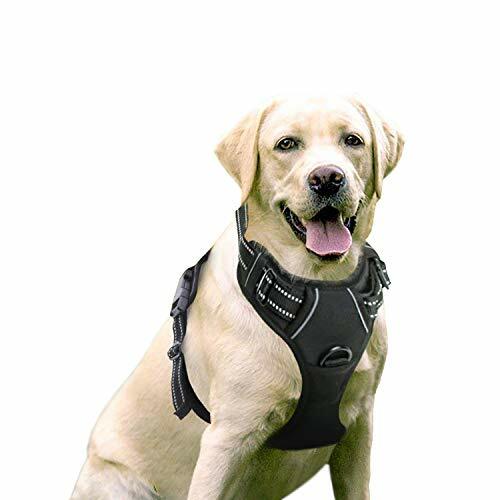 Like the rest on this list, this dog harness reduces pull and strain from pull by evenly distributing it across the chest area. This also has a dual-elastic construction so that your dog feels cozy while in the harness. The PoyPoet No Pull Dog Harness is another one that you’ll need to make sure you have the right sizing for. It’s adjustable, but only so much, and there are tons of sizes to choose from. Make sure you get it right the first time! These are easily the best dog harnesses that you can buy. All of these are great harnesses for your pet, and no matter which one you choose, you can ensure you’re getting a quality product. If you’re an avid outdoorsman, the Chai’s Choice or PoyPet is easily the way to go, but the rest on this list will do fine for casual use.